(CNN) -- I blame Wacky Packages for making me the man I am today. Though there have been attempts to bring them back, Wacky Packages' heyday was in the early '70s. At 9 years old, I became hooked on the Topps-brand sticker series of product parodies, which recast Cap'n Crunch as "Cap'n Crud" and Nestle's Quik as "Nutlee's Quit" ("Explodes Instantly with Milk"). From there, it was a short trip to Mad magazine, "Saturday Night Live," National Lampoon, punk rock, trolling used-book stores and record stores, and indulging in other mind-rotting activities (memorizing trivia, creating puns) until I became the skeptical, disillusioned writer you have before you. Not that Topps, or more specifically illustrator Art Spiegelman and writer Jay Lynch -- goaded by Topps' Woody Gelman and Len Brown -- knew the import of the work. In the preface to the new book "Wacky Packages" (Abrams), a collection of the first seven series of the Topps cards, Spiegelman -- yes, the same Art Spiegelman who won a Pulitzer Prize for "Maus" -- remembers the creation of Wackies as being "a dream job," but something that would probably be forgotten. "It was all done as Part of a Day's Work, much like the way early comic books were made: they certainly weren't made as art, they weren't sold as art, and they weren't thought of as art," he says in the book's introduction. 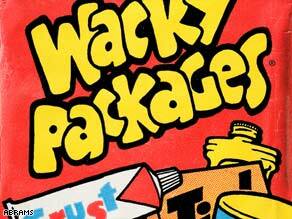 "Wacky Packages just formed an island of subversive underground culture in the surrounding sea of junk." Lynch, a childhood friend of Spiegelman's who worked on Wacky Packages, Garbage Pail Kids and other Topps series, agrees. "I didn't know they were that memorable until about 12 years ago, with the Internet," he says in an interview. (Several Web sites have been devoted to the cards, notably Greg Grant's Wacky Packages pages.) "Before that, I didn't think of it as any more important than the other series." Lynch says that in the beginning, he and Spiegelman earned eight dollars for their basic gags, which would later be fleshed out into paintings by illustrator Norm Saunders or one of the Mad crowd. (They got $50.) Eventually, Topps raised the price of a rough to $20: "Art used to say, 'I like to think of it as drawing twenty-dollar bills,' " Lynch remembers. It wasn't much, but since he and Spiegelman were barely out of their teens when Wackies peaked, it did the job: "A rough would buy a week's worth of groceries," Lynch says, and they'd get to eat their models. "This was before satire became a national industry," Lynch recalls. "It wasn't like, every day, a thousand people would mock Tide." As with all fads, Wackies eventually ran out of steam, and Topps moved on to other series: "Happy Days" cards, the Garbage Pail Kids and superheroes among them. "Anything that happens when you're eight years old can mark you for life -- just ask Sigmund Freud!" Spiegelman says in the book's introduction. "Wackies were a young child's first exposure to subverting adult consumer culture. "Now," he adds wickedly, "thirty-five years later, that generation has matured into adults who can afford to nostalgically consume a deluxe volume brimming with that subversion. Yessirree -- I am proud to have been a worker in the debased basement of the great temple of commerce that is America's popular culture." Oh, don't sell yourself short, Art. There's a whole generation you've warped, too. And I, for one, can't be more pleased.